I moved to Charlotte in 1999 at the age of 13 from a rural town near Buffalo, New York. I remember that year not because of a landmark transition in my life but because that is the year Concord Mills Mall opened. Concord Mills Mall was a big deal to me, freshman in high-school with no place else to hang after school. Every weekend, I would meet my friends at the AMC movie theater and we’d wander the mile-long mall, stopping at Starbucks and Media Play to check out the latest CD release. 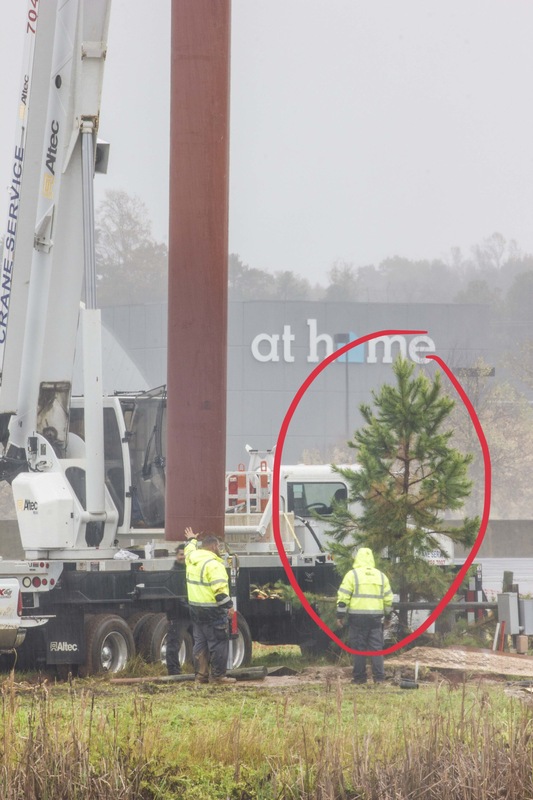 Little did I know that in that year of 1999, a little loblolly seedling would take root right outside the Concord Mills Mall that would eventually impress me with its tenacity for survival in the heavily-trafficked retail area. 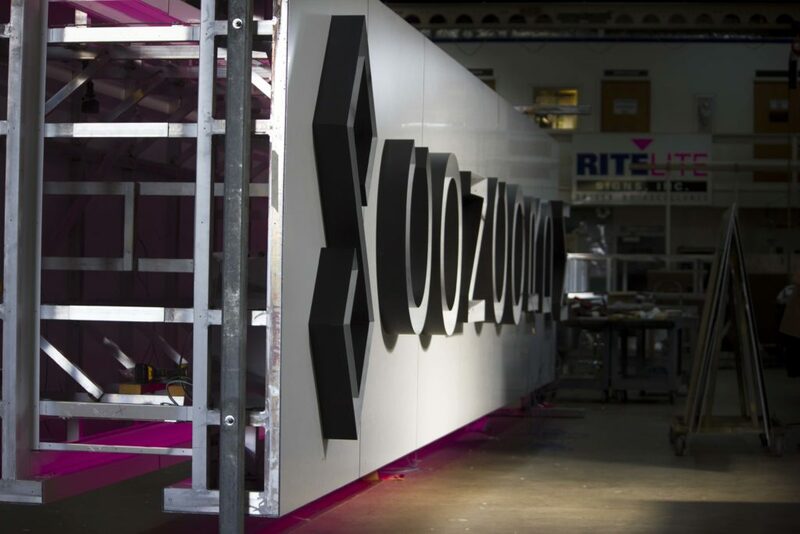 You see, I spent the next twenty years finding my role as a Marketing Professional for Rite Lite Signs, a custom sign fabrication and service company in Concord, just north of Charlotte. 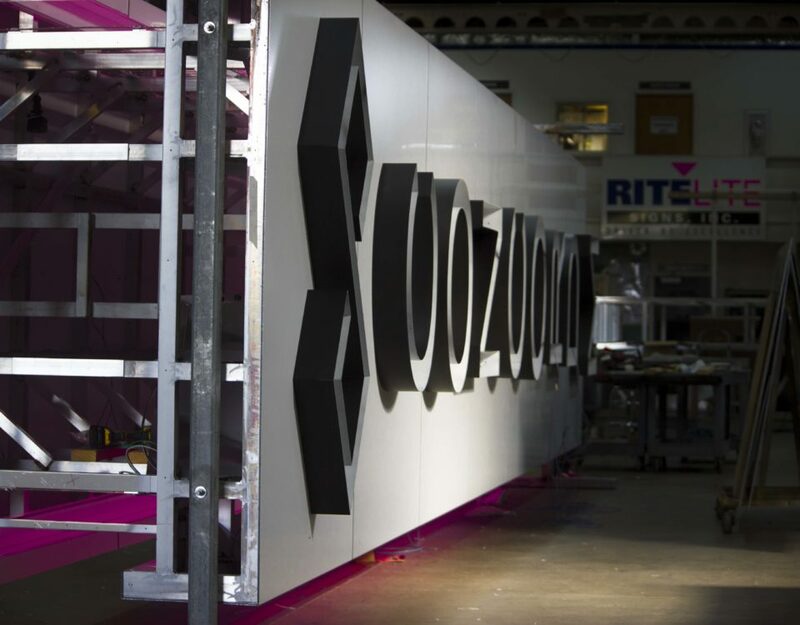 Rite Lite Signs, I discovered, made some pretty cool signs that are both gorgeous on the warehouse floor as they are installed in their final location. I was excited to market a company that made “cool stuff” because I knew the professional images of their work would sell themselves… until that loblolly snuggled itself right up next to one of Rite Lite’s most beautiful signs. When you’re all about the pictures – the loblolly has to go. “Why do you want to cut down an innocent tree,” I can hear you think. 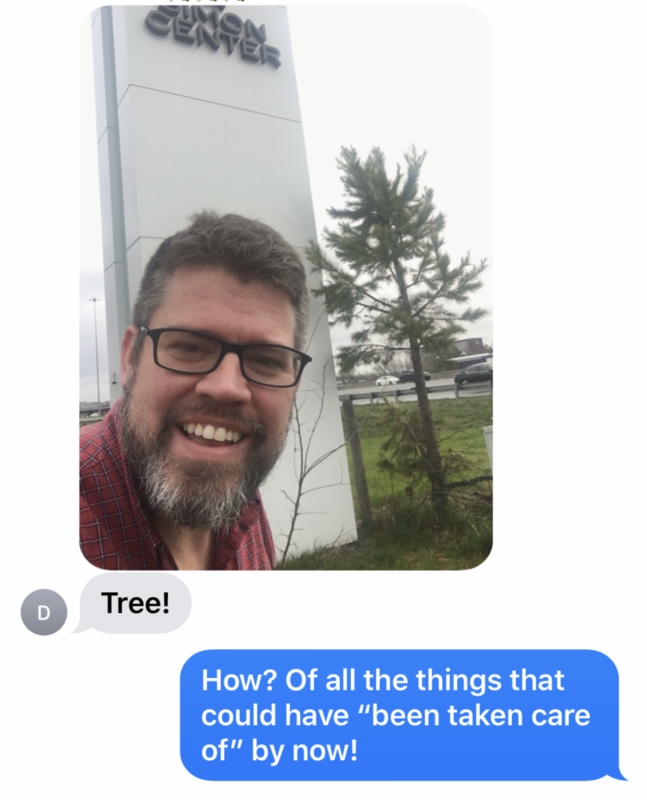 Normally, I wouldn’t desire cutting down a tree for no reason. I love trees. 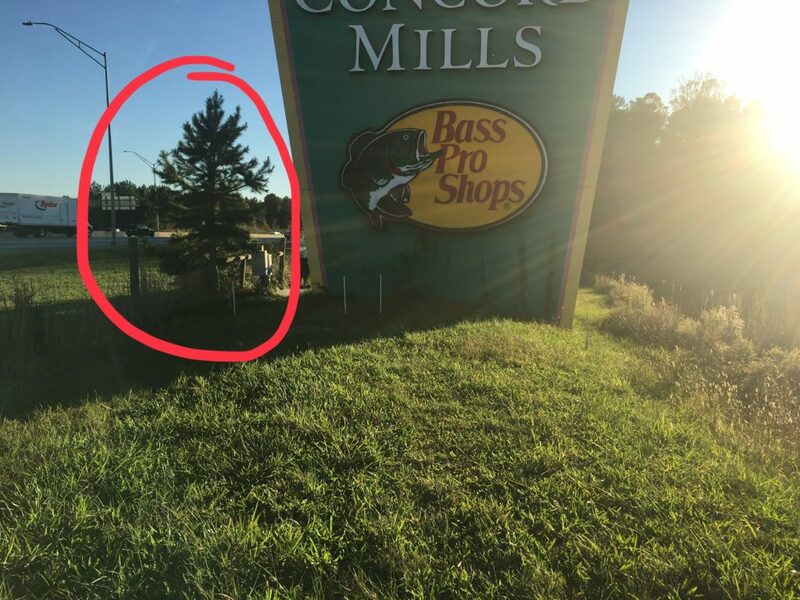 But in the 20 years this tree had been growing, its innocent branches of needles started scratching the main Concord Mills pylon sign. The markings of the loblolly’s growing wing-span were evident by the abrasions on this 20-year-old faded pylon sign as Rite Lite surveyed it for replacement. 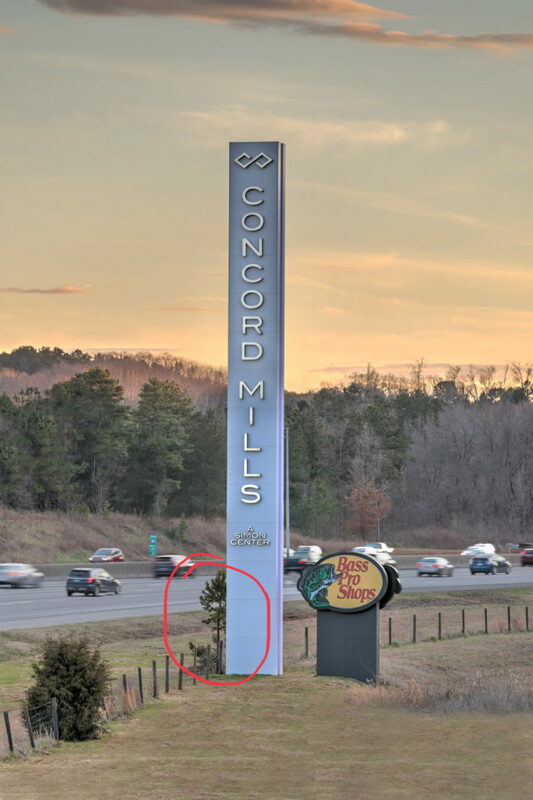 Simon Properties, the operator of Concord Mills Mall, decided to upgrade all the Concord Mills signage in 2018, including the 20-year-old pylon sign on the side of 85 with a new beautifully-treated 70′ white tower pylon sign. This loblolly survived multiple site-surveys with Simon Properties and Rite Lite Signs where a human could have sealed its fate with a stroke of a pen. In addition, the loblolly managed to avoid fatal run-ins with Rite Lite’s beast-of-a-crane truck during the old pylon sign’s removal process. 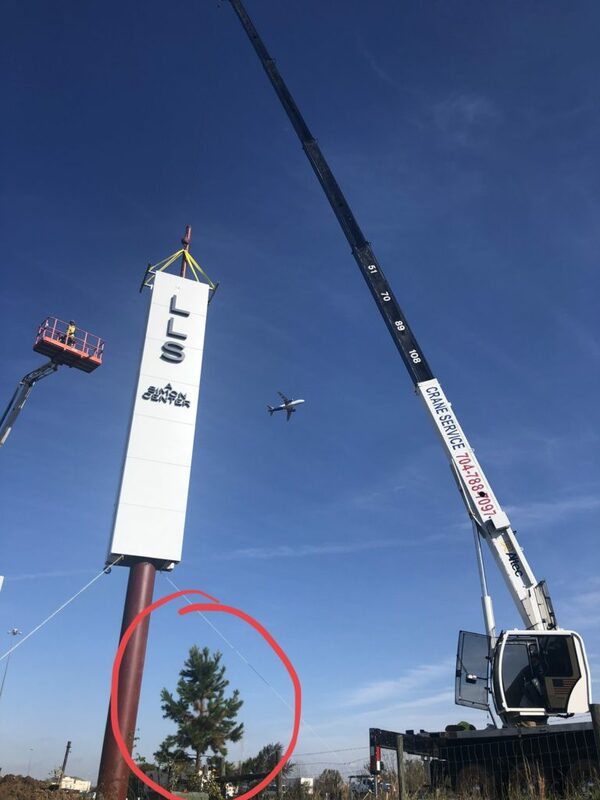 You can even see the loblolly enjoying the installation of the new 70′ white tower pylon sign in these installation photos. What a happy tree. What a lucky tree. 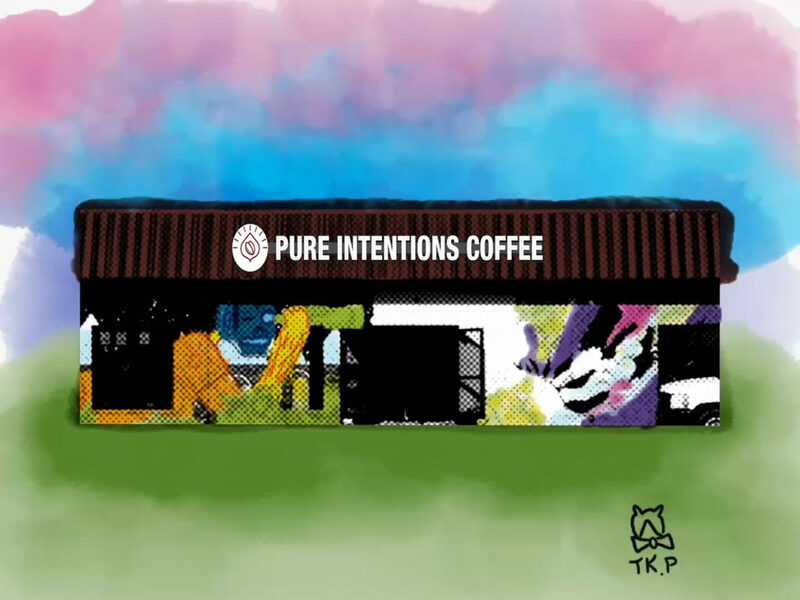 A piece of me wants to let that tree grow… wants to cheer on the loblolly-that-could to the very end of my days – or it’s – because I love tenacity – perhaps not as much as I love perfect pictures of the product I am trying to market!